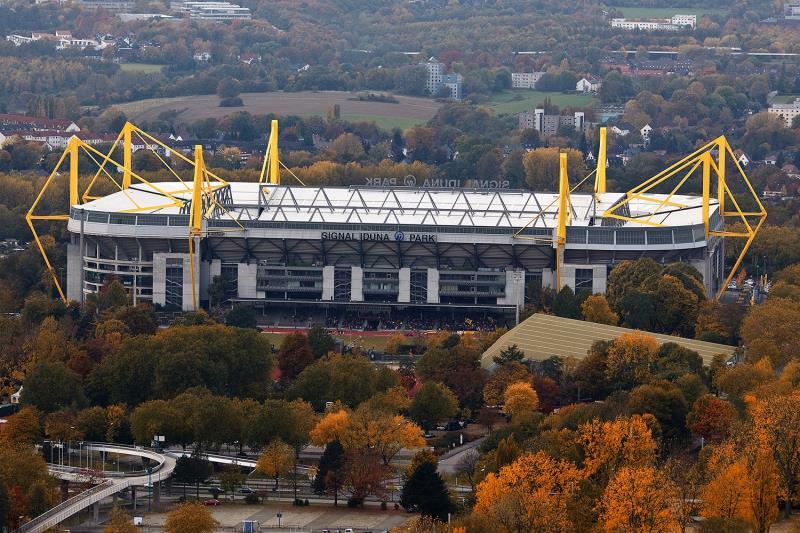 Signal Iduna Park, before 2005 called Westfalenstadion, was built to serve as a playing venue for the 1974 World Cup. 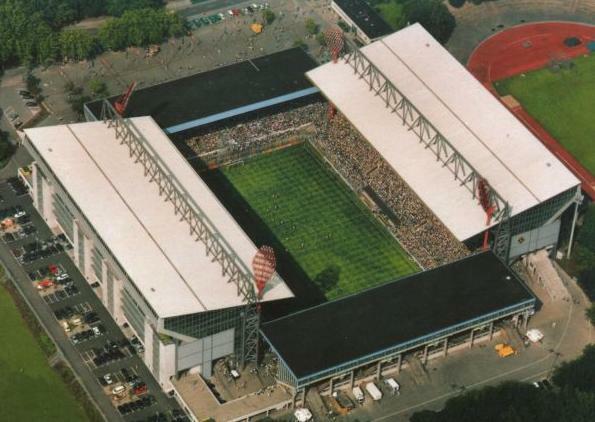 Until then Dortmund had played their home matches at Stadion Rote Erde, and while an expansion of that stadium was first considered, in the end was chosen to build a new stadium all together. Westfalenstadion officially opened on the 2nd of April 1974 with a friendly between Dortmund and Schalke 04. The stadium back then only consisted of one tier that could hold 54,000 spectators, of which 37,000 standing. The stadium stood out because of its rectangular shape in a time when most large stadiums were still bowl-shaped, and its four separate stands served as inspiration for a new generation of stadiums. Ibrox Stadium‘s redevelopment in the late 1970s was, for example, largely based on Westfalenstadion. 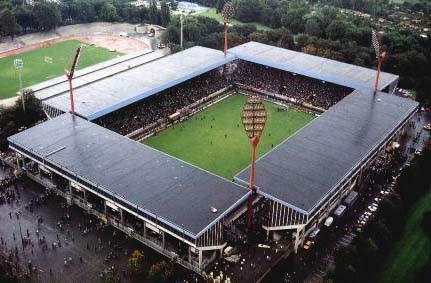 During the 1974 World Cup, Westfalenstadion hosted three first round group matches and the second round group match between Holland and Brazil (2-0). 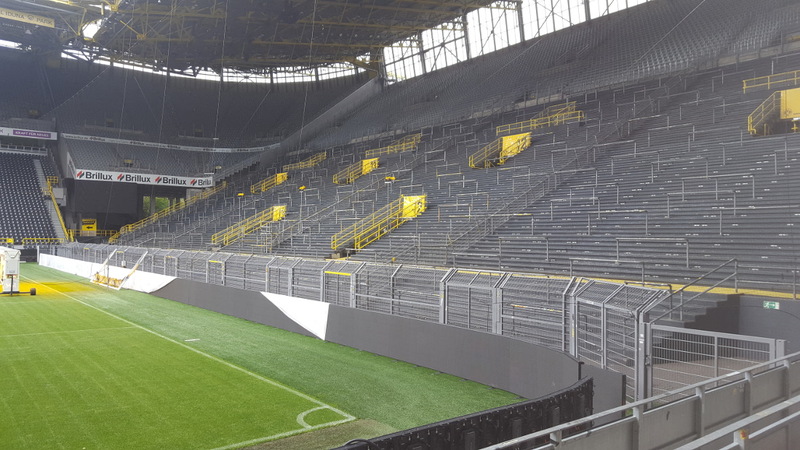 The stadium remained largely unchanged until the early 1990s, when the increased successes of Dortmund grew the need for expansion. 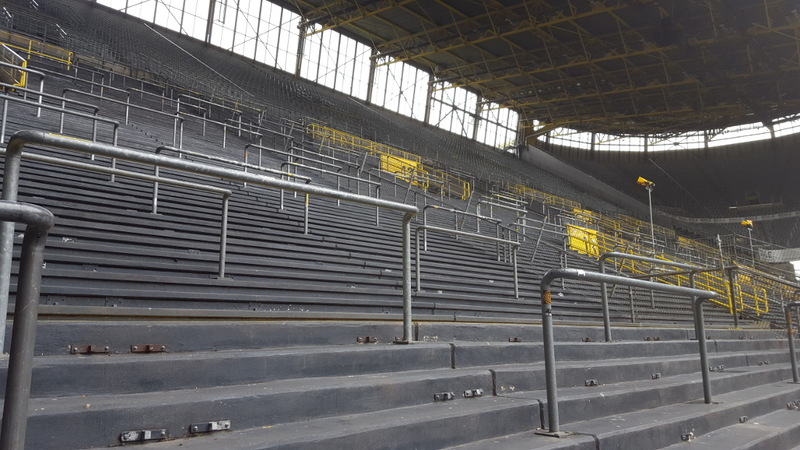 Works started with the conversion of part of the standing areas into seats, actually reducing capacity, but then continued in 1995 with the construction of a second tier on top of the East and West Stand. Shortly after, building works started on a second tier for the North and South Stand, which were completed in 1999. The stadium could then hold 68,600 spectators, and the 25,000-capacity South Stand had become the largest terrace of Europe. In 2001, Westfalenstadion hosted the UEFA Cup final between Liverpool and Alavés (5-4). The redevelopment of the stadium was completed between 2002 and 2003 when all four corners got closed up with stands. 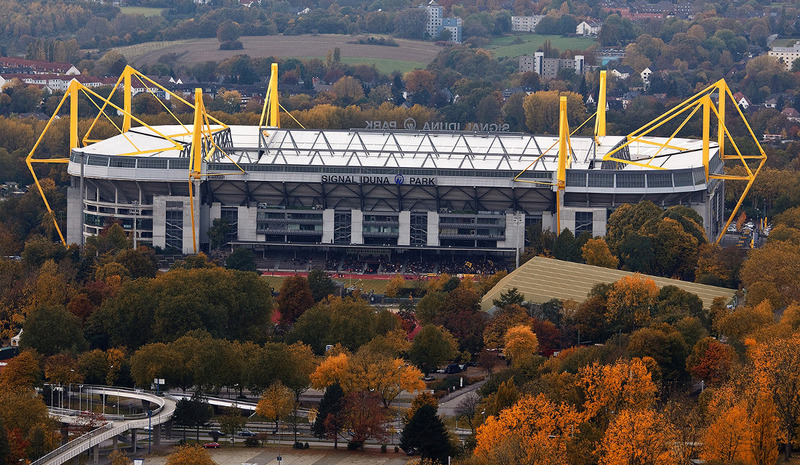 Two years later, in 2005, the stadium changed name to Signal Iduna Park as a result of a sponsorship deal. In 2006, Signal Iduna Park was one of the playing venues of the 2006 World Cup. 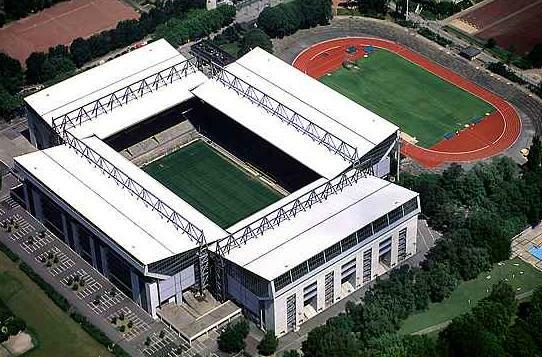 Temporarily renamed and with a reduced capacity of 67,000 seats, the stadium hosted four group matches, a round of 16 match, and the semi-final between Germany and Italy (0-2). 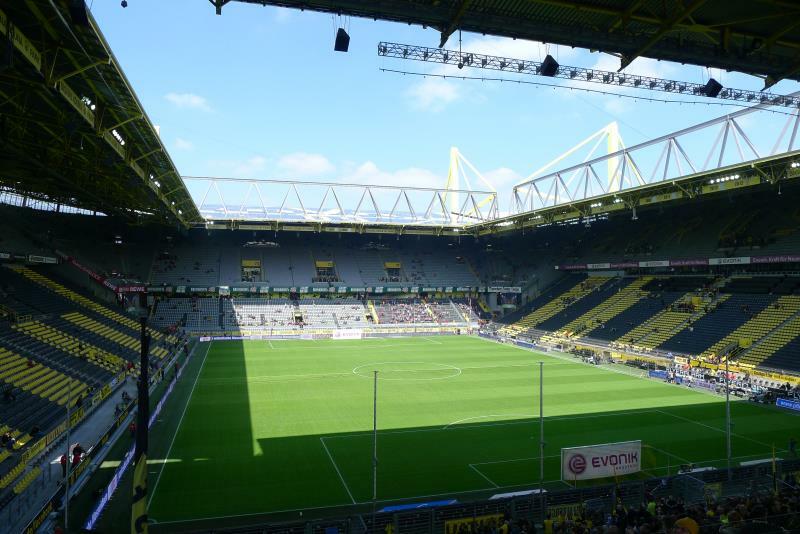 Signal Iduna Park is located in the south of Dortmund near the Westfalenhallen conference centre. Dortmund’s city centre and main rail station are about 3 kilometres away. The stadium can be reached by car from either the B1 (north, east, and west), or B54 (south). If coming from the B1, take exit Im Rabenloh. The stadium lies a few hundred metres to the south. If arriving from the B54, take exit An Der Buschmühle. Drive east until you will turn with a curve onto the Strobelallee and head straight ahead until you see the stadium. Signal Iduna Park can be easily reached by train from Dortmund’s main railway station in the centre. 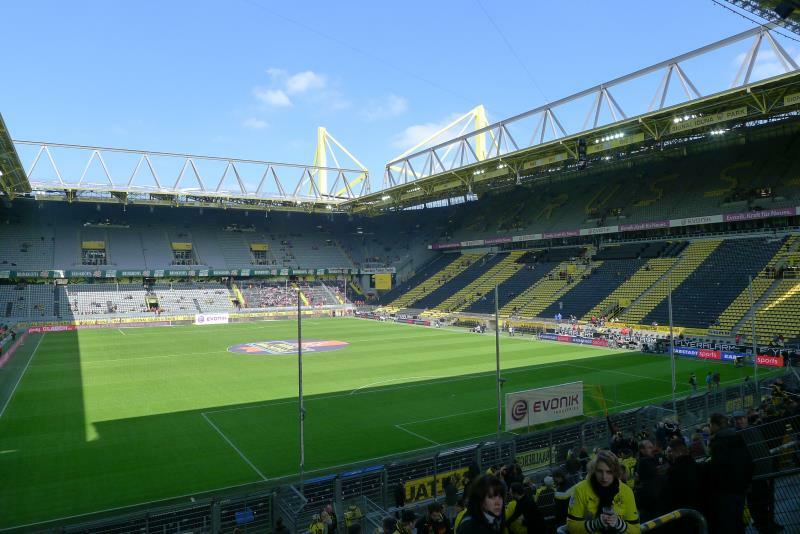 In just 5 minutes you will arrive at Dortmund Signal Iduna Park station, from where it is a short walk to the stadium. Trains typically run three to four times an hour. Alternatively, you can take the U-Bahn from the centre and get off at station Westfalenhallen, from where it is a 5-minute walk to the stadium. Both line 45 and 46 serve the station. On matchdays, there is a special service that will continue to station Stadion, which is even closer to the stadium. The stadium is furthermore within walking distance of Theodor-Fliedner-Heim station, which is on U-Bahn line 42. Signal Iduna Park is located next to conference centre Westfalenhallen, which means that there are quite a few hotels close to the stadium. Mercure Hotel Dortmund Messe is located right across the stadium and gets good reviews. Arcadia Grand Hotel and Steinberger Dortmund are other options. Expect to pay over €100 per night though. Hotel Gildenhof and B&B Hotel Dortmund Messe are cheaper alternatives. Click here for all hotels near Signal Iduna Park. 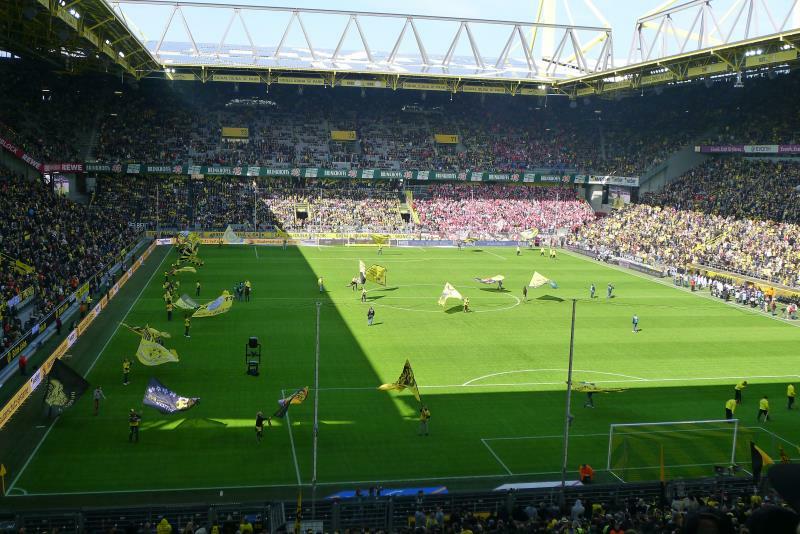 As the stadium is easy to reach from Dortmund’s city centre, you can just as well stay there. Dortmund is not the most interesting city, but there is more entertainment around than near the stadium. There are more cheaper hotels in the centre as well. Click here for the options. If you are planning to stay more than one day or want to join the nightlife, Düsseldorf or Bochum (for nightlife) might be better options to find accomodation. S-Bahn line S1 and regional trains directly connect both cities with Dortmund’s main railway station. There is a nice beer garden next to the stadium which is great if you pass by for a tour on non-matchdays. 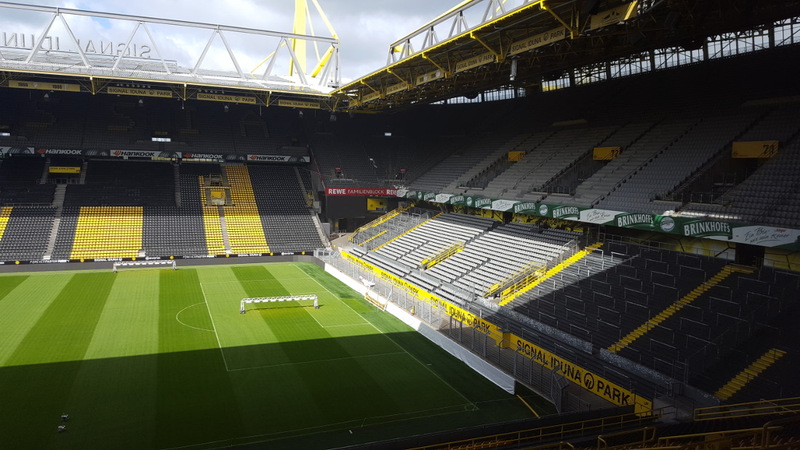 Tickets for Borussia Dortmund games can be bought online, by phone +49 1805 309000 (Tickethotline), in person at the BVB Fanwelt clubshop at the stadium, or at one of the other sales points in the Dortmund area. 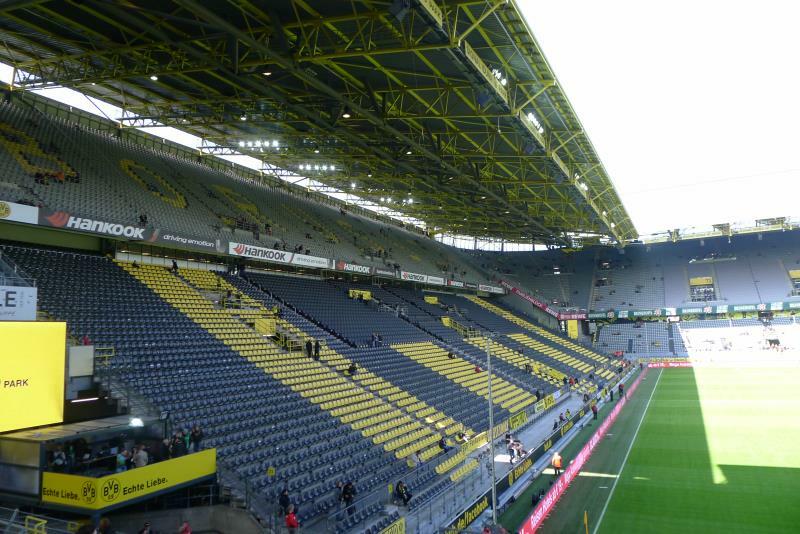 Dortmund sell out Signal Iduna Park pretty much every match, and most league matches sell out right after coming on general sale. Therefore make sure to be prepared and buy straightaway when the tickets go on sale. 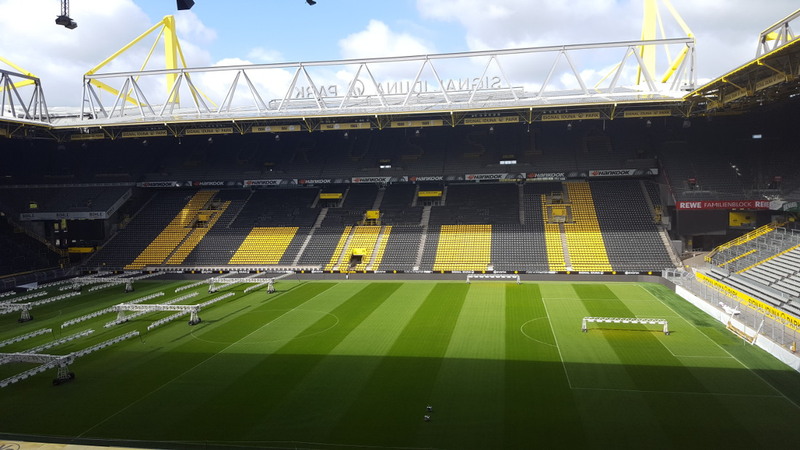 In the rare case that a match does not sell out, tickets can also be bought at the ticket office of Signal Iduna Park from 4.5 hours before kickoff. If you do miss out and wish to buy tickets for a sold out match, secondary ticket websites such as viagogo offer a generally reliable alternative. Of course, be prepared to pay well over face value. Tickets range in price from €31.20 for a seat in the upper corners to €54.40 for a central seat for the main stand. A ticket for the South Stand (standing) costs €16.70. Prices are increased with 20% for the games versus Schalke and Bayern. 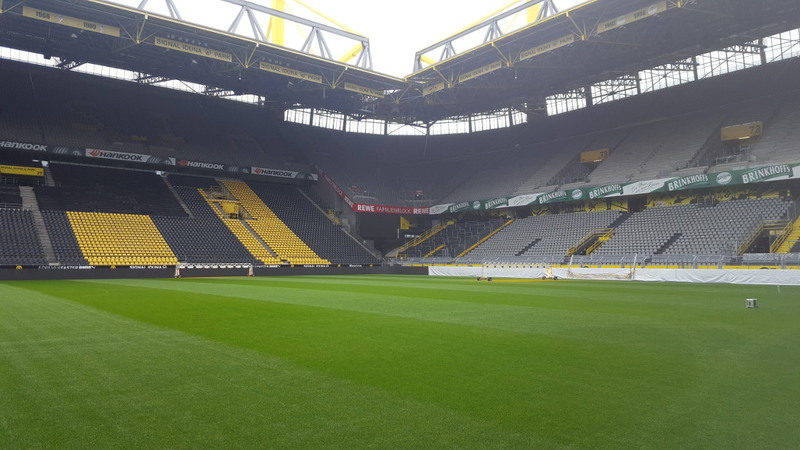 Borussia Dortmund organise guided stadium tours that include the dressing rooms, players’ tunnel, VIP areas, mixed zone, stadium prison, and Borusseum club museum (including trophy room). The tour lasts about 90 minutes, or 120 minutes for the PLUS version including the South Stand. Tours typically run two to three times a day, generally at 12:00 noon, 2:00 pm and 4:00pm, but the schedule varies depending on the season. There are additional tours on the weekend, including one English-language tour. There are no tours on matchdays. The Borusseum opens daily from 10:00 am to 6:00 pm. Tickets can be bought online, at the Borusseum, or at any of the other matchday ticket sales points in the Dortmund area. Tickets can also be bought before the start of the tour, though the group size is limited to 40 people and it is therefore advised to arrive early. The tour costs €12.00, which includes the museum. 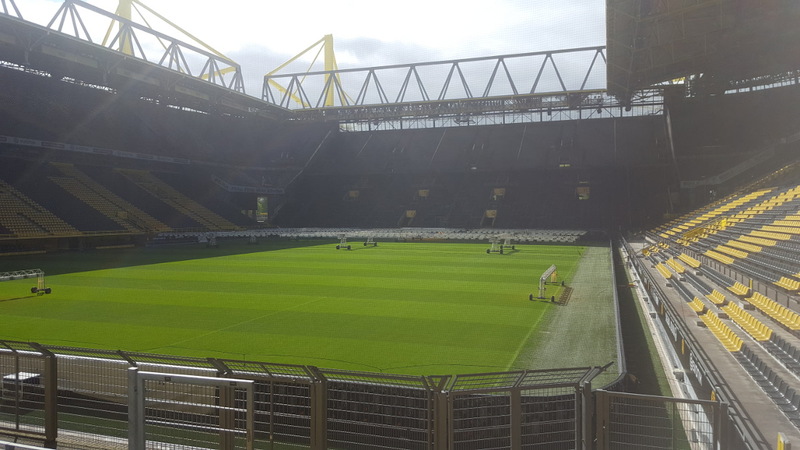 For more information email stadiontour@bvb.de or call +49 231 90 20 6600. BVB.de – Official website of Borussia Dortmund. 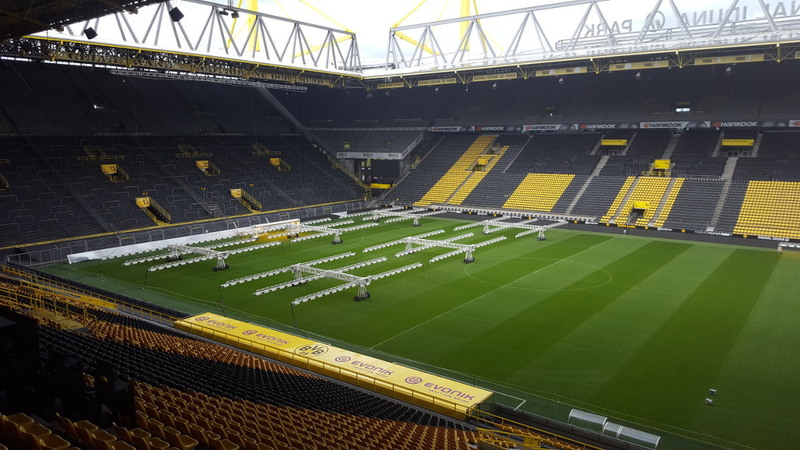 Signal-iduna-park.de – Official website of Signal Iduna Park. Stadion-live.de – Signal Iduna Park event management website. Dortmund-tourismus.de – Official tourism webiste for the city of Dortmund. Bahn.de – Train times and fares. Bus-und-bahn.de – Bus and metro routes and times. Went to watch BVB against VFB Stuttgart in 2014. Amazing experience. Very loud fans. Stadium is easy to reach from Dortmund city centre. People are friendly. It is a-must-see place.